Search engines, including Google, look favourably uponwebsites that are continually updated. In keeping your content up to date with relevant, fresh information you will not only have viewers returning to your site you will also move up through search engine rankings. I have redesigned and rebuilt numerous websites over the years to keep pace with new web trends and technology shifts. With a redesign, not only are you giving the site a new look, but you are also reorganising and introducing new content as well. A website redesign is the perfect opportunity to re-evaluate the content while introducing a fresh new design. Maybe more importantly a redesign is made to keep pace with the ever changing technology a site is viewed on. As of writing Google are looking to introduce a new search index, giving mobile users better and fresher content. More viewers are now looking at sites on their mobiles rather than the desktop computer, and Google recognises this. It is therefore crucial that todays website is 'mobile-responsive'. A redesign may also bring the opportunity to introduce a Content Managed System giving the client a basis to update their own site. This could mean a rebuild in WordPress. This massively popular Content Managed System allows easy content updates whether it be written content, image updates or news articles through a simple to use backend admin panel. One of the best ways to freshen up a website is to introduce new graphics, images and photography. I've worked on countless sites where I've taken photos of a clients new premises, products and/or service they offer and added these new elements to the site. It's amazing how new photography can go a long way to freshening up a site. This could also be in the form of introducing a gallery or slideshow showcasing new products and offers. Again helping keep the site relevant. This is especially important for eCommerce websites where new enticing products and offers will keep potential customers coming back. One of the big trends today is video. Google loves video on a website. Would it be an idea to get a promotional video made advertsing products and services and upload that to the website? 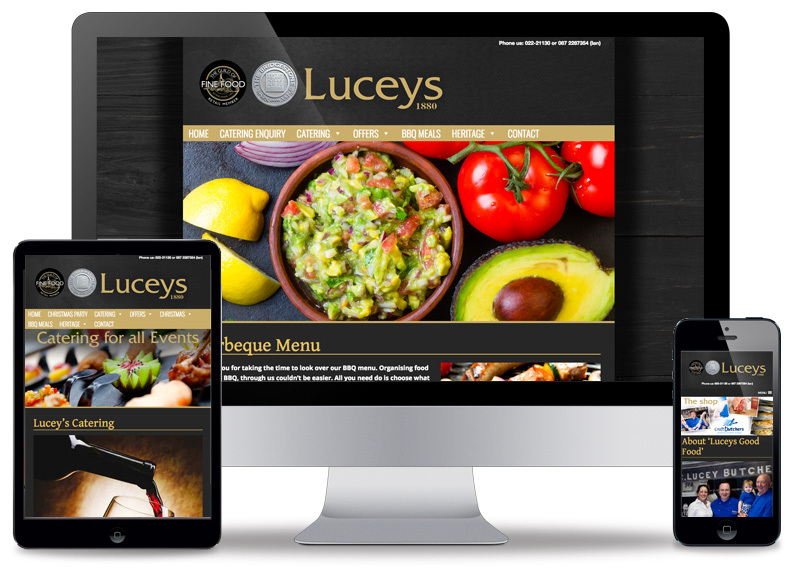 Below is an example of a redesign I did recently for 'Lucey's Good Food Butcher's and Caters' based in Mallow, Cork. The site was a responsive redesign in WordPress. Ideally you'll want to be thinking about updating content on a site on a regular basis as a website left dormant for months is not an ideal scenario. Website maintenance can include new content. Google loves sites that are updated with new information and articles. Keeping a site up to date with fresh content creates a portal of information for the viewer or potential customer. One aspect of website maintenance which shouldn't be ignored is making it difficult for hackers to gain access to your website. This can be done by adding security measures and updates. If it is a WordPress site then there is a plethora of measures that can be taken to strengthen the site against malicious attacks. It is of course vital to make sure backups of your website are made on a continual basis in case the site goes down for what ever reason (including a hack). Maintenance may also include SEO (Search Engine Optimisation) and updating to Social Networks (Facebook, Twitter, Instagram etc). Again, Social Network accounts should not be left dormant and should be updated on a regular basis. For more information please view the SEO and Social Media Marketing page. Oftentimes I have found a client is unable or simply doesn't have the time to make updates and/or maintain their website. They prefer this is left to the web designer. Sixmile Design can advise and put together a maintenance package depending on your needs. This could be a one-off site redesign or monthly contract depending on what you need.